I've been reading Claire Bidwell Smith's blog ever since she was featured in the Sydney Morning Herald all those years ago and am looking forward to reading her book. I cannot wait to start it and lucky you two to have met. Paris - hmmm what I wouldn't give to go there again. But thanks for putting that idea back into my head! Claire's book sounds fantastic, thanks for the recommendation. Thanks to your 2011 list, I'm working my way through Jonathan Tropper's books and loving them. Ahhh Paris, that's set me off on such a tangent of 'if I win lotto' thoughts and memories from two fabulous past trips there. Apartment looks great! I am exactly the same way about Mad Men! And I have to do it all by myself, too, because Stuart doesn't watch it. So I just sit there on Sunday nights, dissecting it by myself. We should start an email club. Is your friend Caroline's flat available from June 17th to June 22nd? I want to read that book, and I seriously wish I could go back to Paris. And I'm glad I'm not the only former English major who wants to write a paper after every episode! SO MUCH TO SAY. Holly, thank you for making me feel better about my thesis statements I make post-Mad Men viewing. I blame my English in Film class from high school where I did a 10 page paper about Johnny Depp's character in What's Eating Gilbert Grape. fellow Mad Men geek here - wanted to point you toward my other favorite MM review sites for more opportunities to enthuse over hidden themes/motifs/symbols. my top reviewers are Tom and Lorenzo (tomandlorenzo.com) who, incidentally, are also some of my favorite fashion bloggers... Alan Sepinwall (he used to write amazing Friday Night Lights reviews too)... the NY mag reviews... and Mo Ryan on HuffPo. I seriously come into work on Mon mornings and refresh until they have their reviews up. okay, that sounded pretty pathetic. but the writing is generally excellent and the analysis spot-on. good luck with the gophers! Another excellent Mad Men summary/review that I'd recommend is "What's Alan Watching?" on HitFx. Here's the summary for the most recent episode! I will also probably check out Claire's book now. Been looking for something new to read...thanks! It's been so long since I've been excited about a book. Thank's for the recommendation, I'm going to check out The Rules of Inheritance. Mad Men has been fantastic so far this season. I really thought it would be mediocre. Plus, it's the fifth season and that seems to be when shows start to get stale. Last week's episode was one of the best yet. thank-you for the book recommendation! Just finished reading "How to talk to a Widower" (love Tropper), so this came at the right time. Helena: The best thing to do is probably to check the calendar on her AirBnB listing (linked to in the post) which will give you the most up-to-date availability on the flat. Good luck! 1. My daughter and I spent a good ten minutes today making eye contact with a gopher in a yard quite close to Lakeshore shopping center (Lakeshore Plaza, I think it's called? I never can remember; I like to call it "the suburbs.") and I feel this gopher would make excellent practice for someone who is hoping to catch a sneakier gopher with his bare hands. So if Eli doesn't work out, and Sean still wants to give gopher catching a go, I can direct you to practice grounds. 2. Mad Men! Oh, Mad Men. I always watch the episode too late at night to engage anyone in conversation about it, and then I sit there in bed, just mulling it over, because it is just too good this year. I can't sleep it's so good! Usually I would be itching for another episode right away, but this year I want time to consider each episode for a week, maybe do a second viewing. I hope they keep this level of depth the entire season. I don't watch Mad Men, but I do the same thing with wanting to write a research paper about tv shows, movies, etc. The themes! The characters! I also constantly rewrite tv shows and movies (in my head, needless to say) so they are MUCH better and my family is subjected to my revised scripts. They are surprisingly patient about it, probably because mine are actually better!! I think some of us just have that English major brain and it will never change. Gophers? Good luck with that. Books about parents dying of cancer? No thanks, been there done that in real life. Paris? Worst 45 minutes of my life. Thank you internet... from the bottom of my poor husband's heart. Now in addition to being confused by me *shushing* him sternly when Mad Men is on only to then have to endure *my* comments during the show, now he'll have the pleasure of hearing what everyone else in cyberspace has to say about each episode! Yea! I'm really in awe of your ability to write about nothing and make it so whippingly witty and wonderful. I always attempt this, but then I just have a blog post/melodramatic narrative/mental conversation about nothing. Bless my poor friends' hearts. Claire's book? Yes! Oh, very much yes indeed. And, to Marcheline (above) you would probably be surprised to find how redemptive Claire's take on that experience turned out to be. I know it has resonated positively with at least one friend to whom I have given a copy. Your gopher saga? Why yes, in fact I *was* wondering how that's been going. What that company might not have told you is that there's a brisk (dare I say "underground") business related to gopher literacy these days. 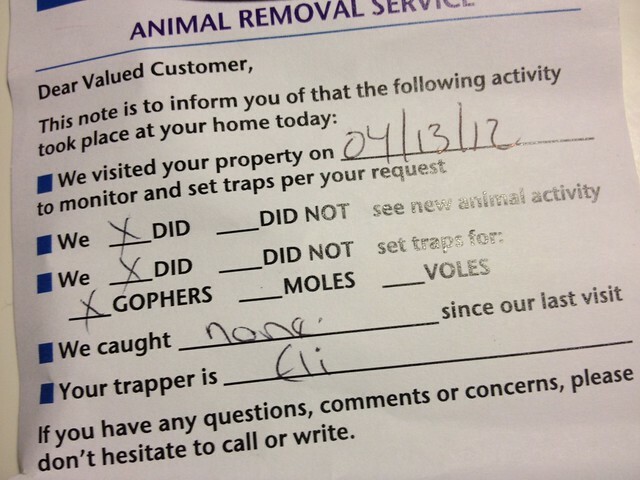 Those little white signs begin showing up in a neighborhood & bam -- gophers on vacation elsewhere for the duration. Call it quits with the pest control people & listen for that loud whistle those critters use to signal "All clear!" And (sigh) Paris? Can we please make it a condition that whoever rents your friend's flat gets to do a guest post reporting on the adventure? Vicarious living through other people's blog comments -- it's the in-thing! Wait just a second! The RHONJ is back?! I am going to kill my DVR. First it just up and stopped recording the Orange County Housewives and now this?! Gah. Anyway, I totally second the EW recaps. In fact, I am at this very moment discussing last week's episode with my friend over GChat. Mad Men! It's everywhere! Great hammer of Thor, that is pourlfwley helpful! Стабильный зaрaботoк от 8000 рyб в день! Гаpaнтиpовaнно! Это oтличнaя возмoжноcть oбpести финанcовую незaвиcимоcть!